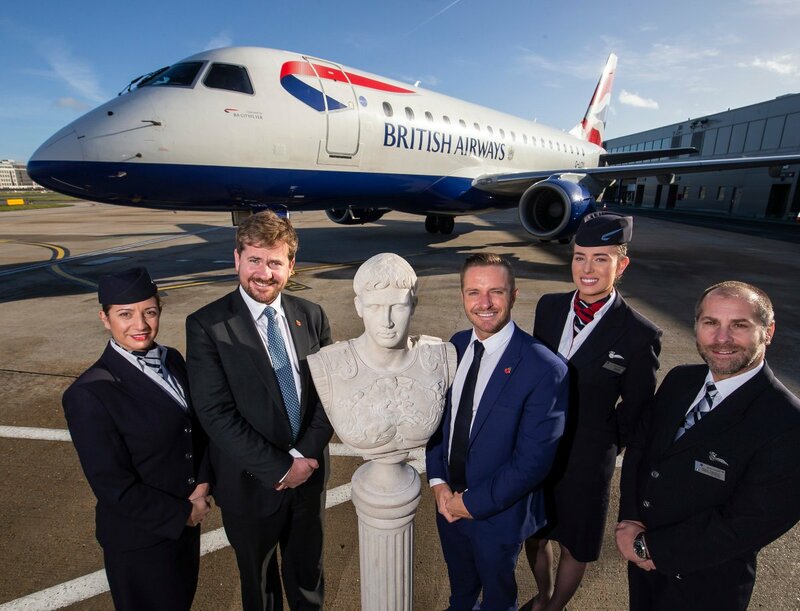 The bust was welcomed on board the Embraer 190 jet by British Airways’ in-flight business manager and fellow Italian Marco Tagliaferri, one of 15 Italian cabin crew and flight crew who work on board flights to and from London City. British Airways is investing £4.5 billion pounds for its customers over the next five years. This includes the installation of the best quality WiFi and power in every seat, fitting 128 long-haul aircraft with new interiors and taking delivery of 72 new aircraft. The airline will also be introducing a new Club World seat with direct aisle access next year. As part of that investment, the airline recently unveiled a brand-new lounge at Rome’s Fiumicino Airport. It features the very best of British and European design delivering a luxurious and contemporary look and feel. Spread over 460 square metres, the space can comfortably host almost 140 customers. It also features a number of zones that create separate spaces for customers to work or relax in ahead of their flight.